M3Power cartridges with Gillette's most advanced blade edge technology. Combine with the M3Power razor for a totally new shaving experience and Gillette's best shave ever. Patented blade coating produces Gillette's smoothest blade surface for incredible glide...and a level of comfort that only M3Power can give. You can feel the difference from the first shave. 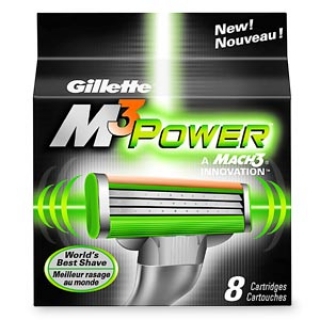 M3Power cartridges can be used with any Mach3 razor. For best results, power up with the Gillette M3Power razor.